Starting tomorrow, April 1, MyCanvas is offering 25% off on photo books and family history books and 15% off on family tree posters and collage posters. The order deadlines for Mother's Day delivery are April 28 (ground shipping) or May 1 (expedited shipping). Also, Wednesday, April 8, attend a free MyCanvas webinar: Creative Gift Ideas for Moms, Dads & Grads. John Pereira and Stefanie Condie will present meaningful gifts that you can make in an hour or two, including family tree posters, collage posters and photo books. The presentation will begin at 8 pm Eastern Time (7 Central, 6 Mountain, 5 Pacific). To sign up, go here. 1. Identify one "elusive ancestor" family (perhaps one you just found, or one you've not found any information about), and the county/state that they resided in. Tell us the family name and the county/state. One of my elusive ancestors (and the topic of my April Brickwall post) is Nelson H. PECK (c. 1819 - 1849) who probably died in Coudersport, Potter Co., Pennsylvania. I found his date of death listed in the Potter County Historical Society's archives of transcribed newspaper extractions. There were no citations listed for the newspaper's name, date, or page number. 2. Go to the FHL Catalog, find the resources for that county/state. The Family History Library Catalog has resources for Potter County here and resources for Coudersport here. Since Pennsylvania did not require the keeping of birth and death records until 1906 and marriage records in 1885, the vital records the FHL filmed will not be of use to me. I'll have to rely on land and perhaps court records to find useful information that might lead me back another generation. 3. Identify at least three items from the FHL Catalog that you need to look into in an effort to further your knowledge about that family's history. Tell us about them. One set of records that may be of help to me is the Orphans' court docket, 1836-1855. Even though Nelson's daughter, my 3rd-great-grandmother, Viola Gertrude PECK, was not truly an orphan when her father died, because her mother, Lura Ann JACKSON PECK, was still alive, there is a possibility that some sort of record could be listed for her. Another possibility is Cemetery records, 1756-1973. Perhaps Nelson's burial place is listed, with other PECK family members buried nearby to give me some ideas of possible relatives. There are a lot of PECKs in this county; I just have no clue how they're related. A third set of records would be the deeds for Potter County, which might show that Nelson purchased or inherited land from family members, or that it was sold or given to family members after his death. One last set of possible helpful records would be the Registers docket, 1836-1908. Although these wouldn't probably give me direct information and original documents, they might lead me to any probate records Nelson had. The FHL didn't microfilm them, so I'll have to research where they're archived. 4. Do you know where your nearest Family History Center is? If not, go here and look for it. Tell us where it is. Yes. As mentioned before, I frequent it regularly. It is the North Spokane Stake FHC. We have three others in this county, and I've been to two of them. 5. Are you willing to make a commitment to go to the FHC and rent microfilms in order to pursue that elusive ancestral family? If so, tell us about your commitment. I'm currently researching another brickwall line, and hope to get to Nelson later this year. He's one of my lines I'm working on breaking down as a goal for this year. The March 2009 Scanfest will be held Sunday, March 29th, from 11 AM to 2 PM, Pacific Daylight Time. Scanfest is a time when family historians, family archivists, genealogists, and genea-bloggers gather to scan their precious family photos and documents while chatting with others about genealogy, preservation, and everything else under the sun! You can visit our February 2009 Scanfest to get an idea of what it's all about, here. Lindon, Utah - March 26, 2009 – Footnote.com, the premier history website for original content, announced today the launch of its Great Depression Collection, which provides unique insights into life’s struggles and the financial challenges Americans faced during the 1930s. The Great Depression Collection includes millions of digitized and indexed documents including historical newspapers. Visitors to Footnote.com can view original pages featuring articles and advertisements that reveal fascinating details about what was happening in Washington, D.C., as well as in mainstream America. Visitors can also read articles about Roosevelt’s New Deal or see how much groceries cost during the time of the Depression. SPRINGVILLE, Utah. - March 25, 2009 - RootsMagic, Inc. today announced the official release of RootsMagic 4, the latest version of the award-winning genealogy software which makes researching, organizing, and sharing your family history easy and enjoyable. With the release comes a free trial version of the software as well as a discount offer for owners of other software products. "RootsMagic 4 is the biggest release in our 20-year history of making genealogy software," said Bruce Buzbee, president. "We've updated RootsMagic to work with the latest genealogical technologies available today, while staying true to our mission to make family history easy, accessible, and fun." RootsMagic 4 boasts an impressive list of new features including integrated web search, improved SourceWizard for citing sources, sharing events among multiple persons, creating pre-defined groups of persons, person and place mapping, recording DNA tests, and improved navigation and data entry. RootsMagic 4 is also one of the only desktop genealogy programs certified to work with New FamilySearch. "A common request that we hear from people is that they don't want their data to be trapped in their computer," said Michael Booth, vice-president of development. "One of the most popular features in RootsMagic 3 is our Shareable CD which puts your data and pictures onto a CD or DVD along with a special copy of RootsMagic. You can then give the discs to family and friends and they don't have to buy or install anything. It's all there on the disc." "We've taken that a step further in RootsMagic 4," explains Booth. "One unique and exciting new feature is RootsMagic To-Go. It allows you to install RootsMagic onto a USB drive and transfer data between it and your computer. This gives you the freedom to take RootsMagic and your data wherever you go--to work, on vacation, to the library--anywhere." A free trial version of RootsMagic 4 is available at http://www.rootsmagic.com. The trial version allows a person to import their data, add information, and play with RootsMagic's major features without any time limitation. "We're so excited about this new release, we wanted to give everyone a risk-free option to try it for themselves," said Buzbee. For over 20 years, RootsMagic, Inc. has been creating computer software with a special purpose--to unite families. One of our earliest products--the popular Family Origins software--introduced thousands of people to the joy and excitement of family history. That tradition continues today with RootsMagic, our award-winning genealogy software which makes researching, organizing, and sharing your family history fun and easy. Personal Historian will help you easily write and preserve your life stories. Family Reunion Organizer takes the headaches out of planning those important get-togethers. And Family Atlas creates beautiful and educational geographic maps of your family history. The 2009 Family Trees and Ancestries, which is a FREE genealogy/family history conference sponsored by the Spokane, Washington North Stake LDS Church, will be held this coming Saturday, March 28th from 8:30 AM to 1:00 PM at the North Stake LDS Church, 401 W. Regina Ave., Spokane. You can get directions, read about the speakers, look at the schedule (there are three session times and 10 classes to choose from), and register online at http://www.spokanegenconf.org/. While the website says the registration deadline is today, March 22nd, I just received news that they will accept registration throughout this coming week. However, if you would like to order a syllabus, you must place your order today. The following EWGS members are part of the line up of speakers: Barbara Brazington will be speaking on "Using County and Local Histories in Research"; Shirley Penna-Oakes will present "What Have You Missed in Vital Records"; and Miriam Robbins Midkiff will give presentations of using the WorldVitalRecords and Footnote websites. Unlike past Family Trees and Ancestries Conferences, the conference will only be held half a day and therefore, no lunch will be available. If you have never had an opportunity to check out a Family History Center or would like to get a friend interested in beginning their genealogy, please consider attending this free conference! It's just five and a half months till the annual Federation of Genealogical Societies “Conference for the Nation’s Genealogists” that takes place this year in Little Rock, Arkansas. In past years it has been in Philadelphia, Fort Wayne, Boston, Salt Lake City, Orlando and other cities. The committees for both the Federation of Genealogical Societies and the host society, the Arkansas Genealogical Society, have been busy working on the details for the September 2-5, 2009 event. The Little Rock Convention and Visitors Bureau and the host hotels have been a joy to work with. • Choose from almost 200 lectures, workshops, special events, and meals offered during this event. • A free Old Fashioned Ice Cream Social for conference registrants on Tuesday afternoon. • Large Exhibit Hall filled with organizations, businesses, and individuals showcasing memberships, publications, databases, hardware, maps, books, digital images, services, and hundred of other items of interest to genealogists and related fields. • Delegate Luncheon and special lectures for Delegates of FGS member societies and anyone else interested in learning more about FGS, running a genealogical society, getting new members, putting on seminars, creating a dramatic website, and much more. • Networking Luncheon with no speaker. A perfect way to meet other conference registrants. Some tables will be designate for certain discussion topics, such as Arkansas research (by sections of the state), Confederate research, Genealogical Blogging (including the use of Twitter and Facebook) and some will have no designated topic. • Several other great luncheons with speakers sponsored by various genealogical organizations. • For the full and varied program and registration details check the Conference website at www.FGSConference.org or the frequently updated Conference Blog at www.FGSConferenceBlog.org. FGS and AGS invite you to join us at this exciting conference. My father's mother's maiden birth name (she was adopted) was Jane Marie (one document says Marie Jane) YORK. Her father's name was Howard Merkel YORK (1898 - 1945). You can read about him on my website here, and there are other posts written about him on this blog here. Howard's father was James L. YORK (1867 - 1933) - blog posts. James's father was John H. YORK (1823 - 1898) - blog posts. John's father was Jeremiah F. YORK, I (1791 - 1876) - blog posts. Jeremiah's father was probably Stephen YORK (1755 - bef. 1840). 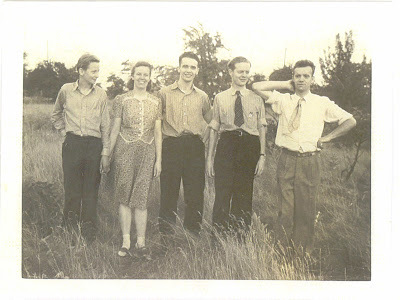 My grandmother had three brothers: Harry Orlando YORK (adopted name: James Howard ERWIN) (1925 - 1962), who died without issue; half-brothers Howard Paul YORK (1943 - 1990) and Peter Alfred YORK (1944 - 1986). I believe both Howard and Peter had sons (I know for certain one did), who could provide Y-DNA samples, if I could locate them and if they were willing to participate. I have been in touch with a few family members of my grandmother's half-brothers' line. Writing this post made me realize that I have data on both current YORK family members and on Stephen YORK that I need to update to my database. Because of the high volume of use of the Seeking Michigan website by the public searching the 1897 - 1920 Michigan Death Certificate database and images, it has been inaccessible to many. I know how to get to that data a different way! Go to http://haldigitalcollections.cdmhost.com/ and click on Search in the left-hand column. At the bottom of the search page, click the Clear All button to erase searching all the collections. Then check Death Records, 1897 - 1920. Go to the top of the page and enter your info in the search fields. Click Search. I was able to continue searching this way, even when I couldn't access the data through the Seeking Michigan portal. I couldn't figure out how to download or save the image using Mozilla Firefox's browser, but could do it with Internet Explorer, by right-clicking on the image and choosing Save Picture As. The Department of History, Arts and Libraries today announced the launch of the Seeking Michigan Web site (www.seekingmichigan.org), a growing collection of unique historical information that – through digitized source documents, maps, films, images, oral histories and artifacts – creatively tells the stories of Michigan’s families, homes, businesses, communities and landscapes. Seeking Michigan’s first major project is the digitization of roughly 1 million death records covering the years 1897 through 1920. These records – never before available electronically – are indexed for easy searching by name, death date, location and age, and hold tremendous research opportunities for genealogists, historians and students. Whether you are interested in Civil War records, photographs, architecture, music, photography or family history, Michigan enthusiasts are sure to discover a brand new side to Michigan through this unique online resource, a collaboration that has long been in the making between the Archives of Michigan and the Library of Michigan. Site design and digitization of resources were funded through various grants. Oral histories with notable Michigan residents. Seeking Michigan was made possible with generous funding from the Talbert and Leota Abrams Foundation, a Lansing-based nonprofit that primarily focuses on funding library and educational science programs. Since the mid-1980s, the Abrams Foundation has provided more than $2.5 million toward the development of the Library of Michigan’s and Archives of Michigan’ genealogy collection, including the digitization of the death records so crucial to family historians’ research efforts. The National Historic Publications and Records Commission provided additional funding. The Library of Michigan Foundation (www.michigan.gov/lmfoundation) and the Michigan History Foundation (www.michigan.gov/mhfoundation) helped facilitate the funding process for Seeking Michigan and provide donors the opportunity to contribute to Seeking Michigan and many other initiatives. The Archives of Michigan is part of the Michigan Historical Center. The Michigan Historical Center and the Library of Michigan are agencies within the Department of History, Arts and Libraries (HAL). Dedicated to enriching quality of life and strengthening the economy by providing access to information, preserving and promoting Michigan’s heritage and fostering cultural creativity, HAL also includes the Mackinac Island State Park Commission and the Michigan Council for Arts and Cultural Affairs. To learn more, visit www.michigan.gov/hal. The flood of visitors searching Seeking Michigan has caused the site's response time to drag. This challenge illustrates how popular we knew the information would be. We encourage researchers to check back periodically and continue to try to explore the site. We are working on the problem and hope to have things running smoothly in the near future. You won't want to miss even one episode in this important saga for your genealogy--tune in, and register to receive all issues, and to be able to add your comments and questions. I've been listening to Mrs. Eakle's lectures on tape and reading her books for several years now, and have thoroughly enjoyed her informative blogs, one on general genealogy, the other on Virginia genealogy. I never read one of her posts without learning something about genealogy, history, and/or records management, and very much look forward to reading her Tennessee blog as a way of tracing my husband's Midkiff roots! Photographing Gravestones an Invasion of Privacy? A church governing board in Fayette County, Kentucky has written David Shannon, a genealogist, forbidding him to photograph any tombstones in its churchyard that aren't of his family members and publishing them on his webpage, http://www.oldunioncemetery.com. Seems they believe this is an invasion of privacy of the deceased (read more here). Or more likely, a way of the public getting information for free that the church is offering for sale. Just a case in point, tombstones are public information. And the dead don't have privacy rights. If it weren't so sadly pathetic, it'd be funny, like one of Chris's Genealogy Exclusives. Seeking Michigan has been adding images of death certificates for Michigan citizens for the years 1898 - 1920 to their website over the past couple months, with this last week seeing a huge influx of data. Genea-blogger Pam Warren tells me that the Department of History, Arts, and Libraries hopes to open Seeking Michigan on Tuesday, March 17th, with slightly over one-quarter of their data online. The plan is to add more data in three or four following stages, and the word from the Archives of Michigan is "it's new, be patient. We're getting fixes as quickly as we can after problems are discovered." I am happy to report that I have found death certificates for half a dozen of my ancestors. Some of it confirmed what I already had, but other information was brand new (always a delight)! I've also found information on siblings, children, and other relatives of my ancestors, expanding my family tree. I have found that running the same search on consecutive days yields new information each day, so apparently data is being added on a daily basis as Tuesday's opening day looms near. Comparing what I've found with data at FamilySearch Record Search, which has Michigan State Births (1867 - 1902), Marriages (1867 - 1925), and Deaths (1867 - 1897) from information gathered from county libers, as well as Federal Census records, helps confirm and expand the information I'm finding at Seeking Michigan. The addition of these death records brings the death record information for Michigan available online for the following years: 1867 - 1897 (FamilySearch Record Search - liber records, images), 1898 - 1920 (Seeking Michigan - death certificates, images, currently incomplete), and 1971 - 1996 (Ancestry - death indexes, transcribed, requires subscription). Michigan began keeping birth and death records in 1867, but they were gathered census-style, once a year by township supervisors and city supervisors or assessors, so many of our ancestors' births and deaths went unrecorded until birth and death certificates were issued in 1905 and 1897, respectively. If you are looking for death records during the "gap" years, check out the Michigan page at Joe Beine's Death Indexes website for county death indexes, obituaries, burial records, and other alternative sources. Finally, if you have ancestors from Michigan, you should be aware that due to severe budget cuts, the Library of Michigan may be closed completely. Pam has a detailed article here, and urges her fellow Michigan citizens to contact their legislators regarding this serious matter. I think it would behoove those of us non-Michigan residents to "contact Senator Thomas George, chairman of the Michigan Senate Appropriations Subcommittee for History Arts and Libraries by phone at 517-373-2768 to express your support for the Library. You may visit his web page for more contact options." These legislators need to know how much such a drastic action would affect those who live outside Michigan and the economic impact it would have on the State of Michigan by cutting out-of-state income from those who would pay research fees or visit the Library themselves. Footnote.com is now offering Tip of the Month videos. March's video is Using Wildcard Searches. Please note: As with all online videos, you need a high-speed internet connection (not dial-up) and speakers or headphones to view and hear this properly. ...and to the Democracy Republic for which it stands, one Nation under God, indivisible, with Liberty and Justice for all. Do you believe that America is a democracy? Did you know that the word "democracy" does not appear in the Declaration of Independence, the Constitution of the United States, nor any of the fifty state constitutions? This interesting and informative video explains the difference between political systems, and why we should hope America NEVER becomes a democracy! I'm really surprised more people haven't blogged about this (Randy did on his Geneaholic blog): Gustave Anjou is on Facebook! For those of you who are saying, "Who? ", let me educate you a bit. Gustave Anjou, born Gustave Ludwig Jungberg in 1863, was--as Wikipedia states--a "self-proclaimed genealogist who has been accused of fakery." Anjou was hired by many East Coast families to research their heritage, and produced multiple massive volumes of family history, intentionally creating false lineages and connecting families without evidence or citations. Genealogical standards are now such that any books authored by Anjou are not considered credible sources. Sadly, many of his books are still found in libraries around the country and are consulted and used by family historians who are ignorant of his shady dealings. Of course, since Gustave Anjou died in 1942, the person claiming to be him on Facebook is not the real deal. There is a bit of a buzz among the genealogists at Facebook as we try to figure out who he really is! Personally, I am wondering if he is the same person as the Ancestry Insider, another mystery person in the online genealogy world! Family Tree Magazine is giving away a free e-book to those who sign up for our free, weekly E-mail Update newsletter. The book is our 42-page Best of the Photo Detective, a step-by-step guide that helps you examine old family photos for hidden clues to when they were taken and who’s in them. It includes an exclusive excerpt from Uncovering Your Ancestry Through Family Photographs by our Photo Detective, Maureen A. Taylor. Family Tree Magazine’s E-mail Update newsletter delivers the latest news, tips and resources for doing family history research. You can sign up at http://www.familytreemagazine.com/enews. After you submit your registration, you’ll get a link to download the book as a PDF file. Did you know you can access a preview edition of the March/April 2009 issue of Ancestry Magazine? This includes articles about Jesse James and facial recognition, handwriting analysis, and how to make a custom family history timeline. Or check out the current issue and archive at www.ancestrymagazine.com for links to articles on a variety of family history topics. MyCanvas has recently added some great new features to their publishing software, including checkmarks that help you keep track of which photos you've already used in a project; the ability to start a calendar with any month of the year; and a color picker, which lets you create a border or background that exactly matches a color in a photo. To learn more, visit their blog. At $79 a DNA test, many more people can afford to take the basic paternal lineage test (Y33), so they can connect with genetic cousins and build family trees. Ancestry's growing database automatically compares results, letting some users connect instantly. And they notify all users of potential new matches as the Ancestry.com DNA database grows. Also, it is now possible to attach DNA to Ancestry.com family trees. The attached results instantly populate up the tree, showing implied meaning for all relevant family tree members. This feature increases the chances for meaningful family contacts and connections. For example, if a man attaches test results to his tree, the profile for his paternal uncle born in 1845 will now display the fact that genetic data relevant to that uncle exists. If another user comes across the uncle (using any research method), they'll now be able to trace the test back to the man who took the test and contact him. Otherwise, that user may never have followed the thread past the uncle. The $79 test also lets users know which Ancient Ancestral group they belong to, like the Stonemasons, the Artisans or the Reindeer Herders. Users learn their likely story of origin and explore Fun Facts for their modern-day group. A great visual pie chart reveals things like 20% of all Stonemasons drive hybrids, 10% eat chocolate ice cream and 55% watch Saturday Night Live! The FamilySearch indexing application is available in three new languages: Italian, Portuguese, and Russian. These languages are in addition to English, French, German, and Spanish. We have current indexing projects in all of these languages except Portuguese. We will be introducing a Portuguese project in the near future. Volunteers can help with any of this projects by registering online at FamilySearchIndexing.org. On the newest episode of The Genealogy Gems Podcast Lisa Louise Cooke's guest is a man who started "living history" from a very young age! Darby Hinton was just 7 years old when he signed on to play Israel, the son of Daniel Boone (played by Fess Parker) in the 1960s hit TV series "Daniel Boone." "You know I really grew up doing it even before I knew what I was doing. It was just a way of life," Darby tells Lisa. Most recently he has been producing a new television series pilot starring his own family called "Hinton Living History" where he hopes to show American families how inexpensive and fun it can be to get out and participate in historical reenactments across the country. "I've had this fascination with history, and it just got to me that the kids just didn't care about it," says Darby. "So what I'm trying to do now is to not only get them away from the computer games and off the couch, but to show other families how they can go do it." In this episode Darby shares what it was like being a child actor, working with folks like Walt Disney and Vincent Price. In upcoming episodes Lisa and Darby will climb the Hinton family tree, and talk about the family history TV series that's in the works. "It's such a pleasure having a guest like Darby Hinton who evokes memories of my own youth growing up in the 1960s," says Lisa. "And this episode is also very special to me because with this 60th episode, The Genealogy Gems Podcast celebrates it's 2nd birthday!" The Genealogy Gems Podcast is a free audio show available on the Web at www.GenealogyGems.TV and through iTunes. Host Lisa Louise Cookes provides genealogy research strategies, expert and celebrity interviews, and creative ideas for sharing and displaying family history. Genealogy Gems Premium Membership offers listeners complete access to all features of the website including members-only podcasts and videos, Message Forum, Newsletter Archive, Genealogy Puzzles, and Behind the Scenes information. Monthly and Annual subscriptions are available. The Family History: Genealogy Made Easy podcast is a free weekly show that walks new and experience family historians alike comprehensively through the research process, featuring national genealogy experts. Lisa Louise Cooke is also the host of the The Family Tree Magazine Podcast. She is the author of the book Genealogy Gems: Ultimate Research Strategies, and a national genealogy speaker. Calvin, Catherine, Adrian, Millard & Benjamin DeVries. C. 1938. Original photograph privately held by Brian DeVries, [ADDRESS FOR PRIVATE USE], Belmont, Michigan. 2009. Ouch! I've been sore again for days. I've had to be on the computer a lot at work, and some at home for classes and presentations I'm doing and articles I'm writing. So I'm back to barely blogging again (sigh). I did have to take a moment to tell you about an amazing blog I stumbled upon, called Finding Grandpa. It many ways it reminds me of my search for my paternal grandmother's biological family. I wish the author well, that she would find peace for herself and her mother. I'm so glad my grandmother was able to make peace with her past 12 years ago, as she now has Alzheimer's. Finding Grandpa brings up many emotional aspects and ethical questions. I invite you to read it. Read "11 Ways to Create Backups and Prevent Data Loss" by Thomas MacEntee. Read the March 2009 Scanfest post.